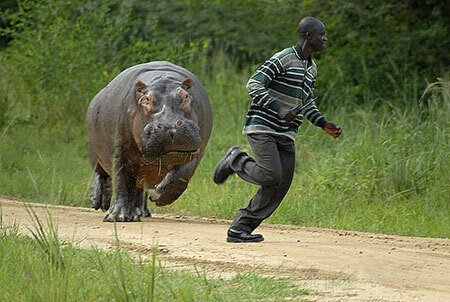 This gamekeeper sprints for his life after disturbing a hungry hippo while it was stuffing its face. He fled as the angry three-ton beast – which can hit speeds of up to 30mph – charged at him, still with a mouthful of grass. The keeper only managed to escape a nasty end with an impressive 100m dash – in flat work shoes. via Curb your hippo! – mirror.co.uk. Twins born 51 hours apart… Wait. What? After giving birth to her son Ryan, Hayley Phillips thought it wouldn’t be too long before his twin brother followed. In fact, it took a further 51 hours – and a second labour for Miss Phillips – before Lewis eventually made his way into the world. The twins – who as well as being born on different days also have different star signs – are now set to mark their first birthday, with Ryan, a Leo, celebrating tomorrow and Lewis, a Virgo, two days later on Tuesday. via Twins who were born 51 hours apart Mail Online. August 23, 2009 Posted by oldstersview | astrology, Strange	| Sun Signs, twins | Comments Off on Twins born 51 hours apart… Wait. What?